Toronto-New York on The Maple Leaf. The better part of this day was taken up by travel from Toronto to New York City on Amtrak’s daily train, the Maple Leaf. Technically, it’s a VIA Rail train for the first couple of hours, the time it takes to travel from Toronto’s Union Station to the U.S.-Canadian border at Niagara Falls, New York. At that point, an American crew takes over. 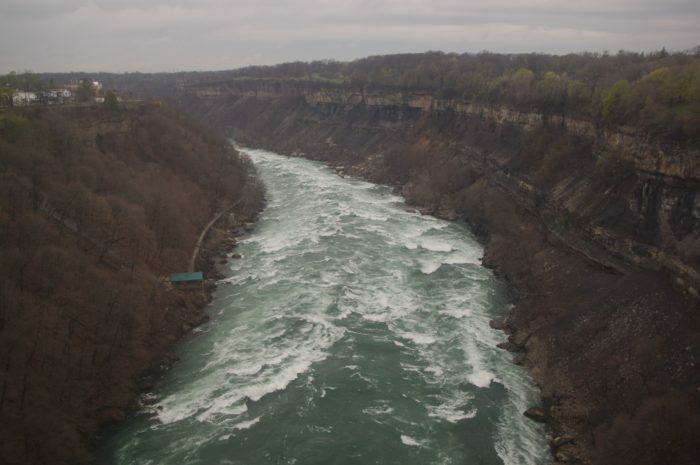 By the way, the Niagara River is the border at that point and it is a formidable barrier–a foaming torrent at the bottom of a deep gorge. Far more formidable, as one of the passengers noted, than “that stupid wall”. Also of note is the new facility occupied just across the border by the U.S. Customs and Immigration people. It’s been open for just five months and is a huge improvement. Passengers sill have to take all their luggage off the train, but at least here is now a high concrete platform so bags can be rolled right off the train and down a ramp to an X-ray machine. One awkward element to the Maple Leaf’s run has to do with the Café Car, which consists of a serving area, a lounge area with booths, and the train’s Business Class seating, shown above. When we boarded in Toronto, a female VIA employee was hastily stocking a few of the refrigerated cabinets with items for sale during the two-hour run from there to the border. About 20 minutes before we arrived there, she began frantically packing up her entire inventory, which she and another VIA employee carted off before the train proceeded over the border. Once in the U.S., and while all of the passengers were being processed, the Amtrak employee in charge of our Café Car brought in what looked like eight or ten big cardboard boxes filled with his inventory. 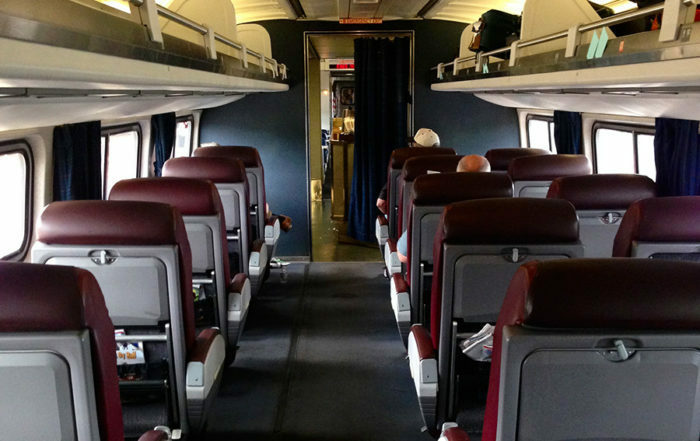 The café and lounge areas take up about two-thirds of the standard rail car. Seating for Business Class passengers is in the other third, so we got a good view of the attendant trying to get all of his snacks and drinks and packaged meals stowed before we departed Niagara Falls. He didn’t make it. In fact, it took him over an hour and by the time everything was stacked and piled and stored either out of sight and out of the way, his mood had darkened. For the rest of the trip, his presence could best be described as ranging from neutral to sullen. And no item was removed from one of the seven or eight stainless steel refrigerated cabinets without the door being peevishly slammed shut. By the time we arrived at Penn Station, several thousand slams later, it was starting to work on me like the dripping water torture. The only other thing of some interest is that today’s Maple Leaf arrived at Schenectady, New York, almost 50 minutes early, so we sat in the station until the regularly scheduled departure time. Somehow, we still managed to arrive at Penn Station ten minutes late. NOTE: The above was posted without proofreading very late last night here in New York after a visit to a nearby Irish pub for a later meal. Upon review this morning I discovered a couple of phrases that made absolutely no sense whatsoever. The have been summarily deleted. Previous Blue Jays Fans Lose Loud. It seems a bit harsh to summarily fire someone for having a bad day in the office. Especially if the working conditions aren’t exactly great, not having enough time to stock everything on board seems enough to be a bummer to me. Charles! All labor unions are not creations of the Devil! I don’t know if the union representing these Amtrak employees provides counseling services for its members, but many do. Rather than having the young man “summarily fired”, as you recommend, wouldn’t it be better for all concerned, including Amtrak, if he was put on probation, and through counseling, helped to become a good, productive employee?